Agricultural feedstocks for Ingeo biopolymer will be certified as environmentally and socially sustainable by the International sustainability & Carbon Certification System (ISCC PLUS) standard of best practices in agricultural production. NatureWorks was the first biopolymers manufacturer to become certified to the new ISCC PLUS standard in 2012, and currently has more than 40% of its agricultural feedstock certified. At full capacity, more than 90 farms will be involved in the program by 2020. Protect highly biodiverse and high carbon stock areas. Implement best agricultural practices for the use of fertilizers and pesticides, irrigation, tillage, soil management, and the protection of the surrounding environment. Comply with human, labor, and land rights. Comply with laws and international treaties. Implement good management practices and continuous improvement. We're proud to announce and introduce Ingeo 3D450, a new break-away formulation for use in dual extrusion 3D printers. The clean, fast mechanical break-away of Ingeo 3D450 support structures results in parts with high finish quality, reducing post-processing time and improving overall productivity. Eliminating plastic we don't need and ensuring all plastic we do need never becomes waste. This is why we signed the New Plastics Economy Global Commitment. The new Spring 2019 Report is now available complete with company-specific goals and with new companies signing on all the time, our efforts are growing! Congratulations to Fitesa who walked away with the "Roll Goods Achievement Award" from IDEA2019! Their outstanding 100% biobased Ecofabric made from Ingeo resin certainly caught the attention of the global fabrics and nonwovens industry! Fitesa offers a BioBase material made from 100% renewable, compostable resin, with soft touch – superior to standard PP spunbond materials and other BioBase spunbond products. NatureWorks is delighted to announce the addition of Matt Romberger to our team in the role of VP of Sales and Marketing. Matt brings an extensive record of international market development, sales, management, marketing, strategy, and Six Sigma experience. Welcome, Matt! 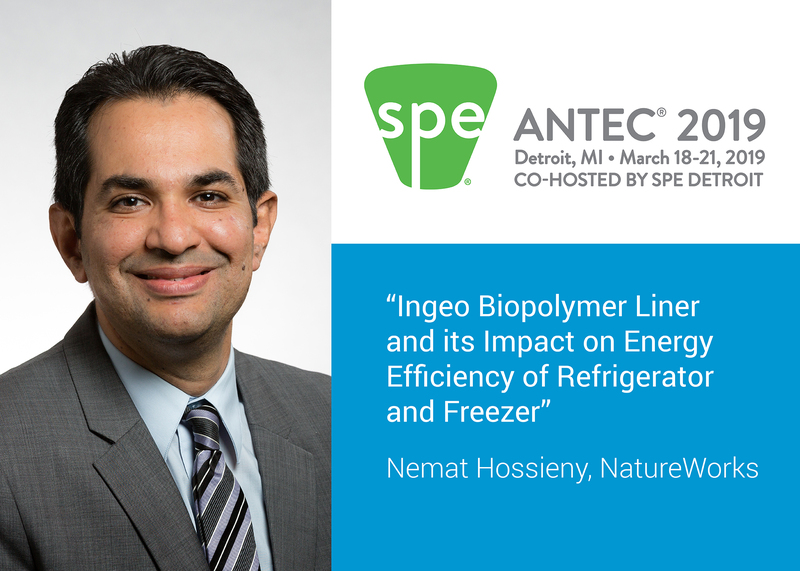 NatureWorks' Lead Scientist, Nemat Hossieny presented his article, "Ingeo Biopolymer Liner and its Impact on Energy Efficiency of Refrigerator and Freezer" at the Bioplastic Symposium at this year's SPE ANTEC 2019 in Atlanta, GA. Read the article here. NatureWorks' VP of Performance Packaging, Steve Davies presented, "Compostable Capsules Developments: What's Really Happening on the Frontline?" at the AMI Single-Serve Capsules show in Atlanta. NatureWorks will demonstrate printing with our brand new custom Ingeo PLA 3D printing materials specifically designed for industrial-use parts including high strength, heat resistance, and clean incineration for foundry applications while maintaining printability. Titan Robotics will host the printing at their booth #78, Monday, April 1st between 10AM - 2PM. The past year has seen numerous initiative established in response to an explosion of concern around used packaging. Be part of the SPC Impact conversation that is more than just reactive and help set the course that addresses the root cause. April 3rd, 3PM - NatureWorks' Flavio Di Marcotullio will present, "Case Study: Rethinking the Single Use Coffee Capsule". April 3rd, 4:15PM - NatureWorks' Tim Goodman will participate in the "Compostable Foodservice Packaging: Making the Case to Composters" panel. April 4th, 11AM - NatureWorks' Nicole Whiteman will participate in "The Whole is Greater Than the Sum of its Parts" panel discussing the synergy to improve the compostability of high-performance paper packaging with functional coatings, laminates, adhesives, and additives. This event is the LARGEST GATHERING of adhesive & sealant professionals in North America. The three-day event will include concurrent technical sessions focusing on business development and market trends, technology/applications, building & construction (roofing), regulatory, processing/operations, market segments and new product introductions.